Combining premium electrical features and a 46 inch fixed position fold away ironing board, the Iron-A-Way E46MDU E46 is the built in ironing center of choice for those needing extra ironing length with electrical built in. The premium length ironing board is a made of solid, ventilated steel, and features a heavy duty undercarriage that was custom designed for ironing use. The premium E46 is complete with an electrical Raceway, powered by a sixty minute motor timer, and accompanied by a spotlight for locating tough wrinkles on garments. 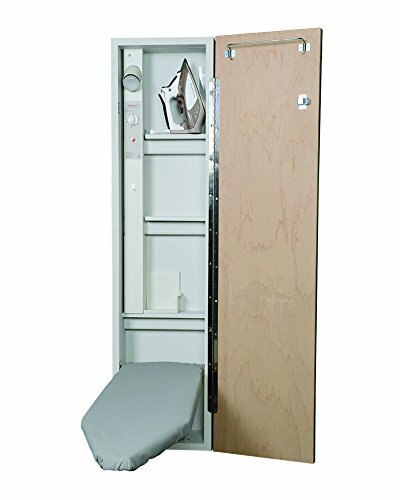 The hot iron rest provides a safe area for the iron to be set aside while garments are adjusted, and when finished ironing, the premium sized iron storage area allows the iron to be stored hot. The safety Disconnect switch cuts all power to the unit when the board is returned upright, allowing you to leave the iron plugged in and ready to go. And electrical cord cover and restraints help guide the cord over the board, eliminating potential snags. The unit can be wall mounted or Recessed for a flush installation. If you have any questions about this product by Iron-a-Way, contact us by completing and submitting the form below. If you are looking for a specif part number, please include it with your message.